It’s estimated that nearly 25% of all employees leave their job because the company doesn’t offer enough training or learning opportunities. On the other hand, companies who do offer e-Learning and on-the-job training generate about 26% more revenue per employee. Corporations now report that e-Learning is the second most valuable training method that they use. This is no surprise, given that e-Learning saves businesses at least 50% when they replace traditional instructor-based training with e-Learning. A recent study, conducted by The Research Institute of America, shows that e-Learning has the power to increase information retention rates by up to 60%. Not only is e-Learning cost efficient for companies, but also it’s also more effective in terms of knowledge. e-Learning helps your employees keep up-to-date with changes in the industry, which in turn helps companies remain competitive. Allow Global IT University to develop a customized and effective e-Learning system and generate more revenue per employee. Charles L. Fox, Jr., CEO of Global IT University, Inc. was nominated for Citizen of the Year at this year’s 19th Annual Clearwater Beach Chamber of Commerce Banquet. 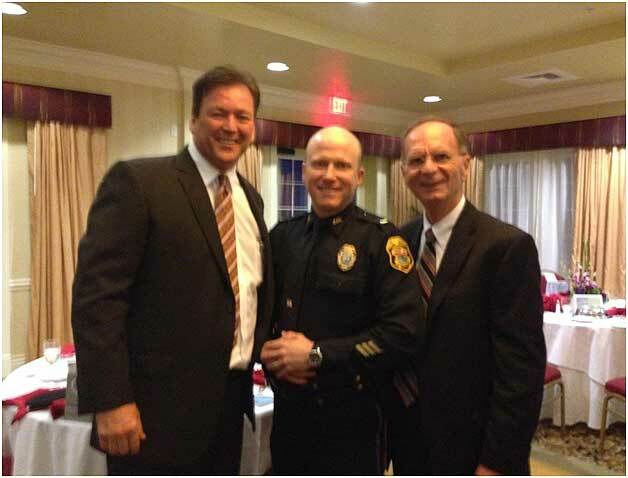 Mr. Fox is pictured here (left) with this year’s winner, Lieutenant David Dalton (right of Fox), and City of Clearwater Mayor, George Cretekos. Global IT University offers unparalleled robust learning management systems that track employees from pre-hire to retire. Global IT University also instructs small businesses on strategic ways to increase business with local governments. Founded in 2001, CEO, Charles Fox envisioned a dynamic system that would simplify the user interface and make learning easier. The e learning systems are self-paced and can be accessed from any location, and any browser. This type of training solution provides flexibility and convenience in today’s hurried lifestyle. Many companies “talk the talk” but simply cannot keep up with the stride. Global IT University exemplifies what customer service should be. When you continuously focus on servicing your client you’ll reap the rewards of new clients, by word-of-mouth alone. I can’t tell you how many clients contact us because they’ve heard good reviews about our e-Learning Center and our outstanding customer service. So what’s the secret? Great customer service cannot simply be your tagline – you have to believe it and make your customers a believer. More importantly, every staff member has to believe in your company mission. When the entire team is on board, then you are well on your way to greatness. Turn more attention to what’s occurring around you – Do you see great customer service? Is your business excelling? Global IT University regularly asks clients how we’re doing and how we can become even more helpful. The secret is to listen to your clients. Reviews and recommendations can be helpful and in the long run they can help boost your popularity. Did you read our last article? Client enthusiasm makes our work fulfilling and reminds us that we’re on the right track to helping more and more people return to education. “On behalf of my IT group, we would like to thank you for the extended technical information provided to us by your Microsoft & Technical Library products. I’m impressed! Have you seen the client review from Quantas? “At Qantas Vacations, our policy is to give the best service and expect the best service. Global IT University has been just that! The software I’ve implemented turned out to be more than just a simple reference tool . In fact, I have become reliant on Global IT University and consider them an essential element in my business. When Retired Rear Admiral Delaney received a recommendation about Global IT University in Clearwater FL and the commitment of CEO, Charles Fox to help Move America Forward, Global ITU was propelled into Florida’s limelight. Reviews and recommendations about Global IT University have been outstanding since the company was founded in 2001. Why is Global IT University Bursting with Reviews and Recommendations? We don’t ask our clients to go online and review us so how are we so popular? We provide a customer survey for our own internal reviews and we state, if you like us, shout out about us. A prospective client called me up yesterday and said ‘Global IT University comes highly recommended…and we’ve read the outstanding reviews and recommendations from some of your clients.” Well we certainly work hard to accomplish these accolades. You don’t come by word of mouth recommendations unless clients really value your work. Not only that but all our Global IT University staff pride ourselves on giving more. Good is never good enough because you’ll only receive good reviews. Outstanding and Exceptional is what we strive for. That’s why we get calls from friends-of-friends and past and current clients. Just take a look at our reviews and you’ll see how much effort we place in our work. Executive Bio | Charles L. Fox Jr.